The Quinnipiac Bobcats men's ice hockey team finished the regular season with a record of 19-13-2 having earned the number five seed in the upcoming ECAC playoffs where they will face the Brown Bears in the opening round of the playoffs. Its the first time since the 2011-2012 season that Quinnipiac will open the playoffs in the first round having had a bye the last four seasons. With that said let's take a look at what some of the future Bobcats did as many of them are heading towards the playoffs or their season has ended. There is no way we can start this notes column and not talk first about 1999 goaltender Keith Petruzzelli of the Muskegon Lumberjacks (USHL). The top rated North American goaltender in the Central Scouting Rankings who scored an empty goal on Friday night against the Madison Capitols from his own crease. You can check the video out here. Its an impressive play by Petruzzelli which requires a split second decision making to get this shot off instead of covering it up for the face-off which many other goaltenders possibly would have done. He shows tremendous ability to quickly control the puck put it on the ice in front of him and have quick stick work in order to flip it down the ice for the goal. On the season, Petruzzelli is 16-9 with a 2.61 goals against average and a .906 save percentage with two shutouts. His 16 wins are the most for a rookie goaltender in the USHL this season. The gem of the 2017 Quinnipiac recruiting class, its possible that he could get drafted in the first two rounds of the draft depending on which franchises are looking for a goaltender of the future. Another one of the Bobcats incoming commits for 2017 continues to remain hot. 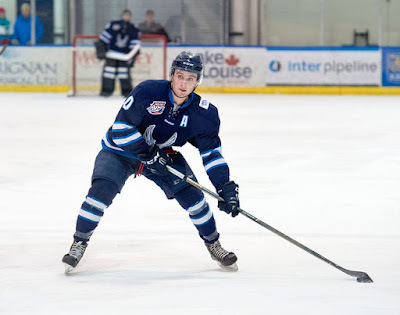 1996 forward Matt Forchuk of the Canmore Eagles (AJHL) is on an 11 game point streak (8 goals and 16 assists). In two games this past weekend he had two goals and four assists. He continues to remain the leading scorer in the AJHL with 93 points (29 goals and 64 assists) in 54 games. Canmore has two regular season games remaining so he would need a huge two games to reach 100 points for the season. He has missed four games this season which could have helped his point totals even more. The 93 points and counting are the most for an incoming recruit since Travis St. Denis had 88 points for the Penticton Vees (BCHL) in his final season of junior hockey. 1997 forward Odeen Tufto had two more assists this weekend for the Sioux City Musketeers (USHL). He is tied for 14th in scoring in the USHL with 33 points (9 goals and 24 assists). His 24 assists are tied for 7th in that category. A native of Chaska, Minnesota, Tufto has 12 points (4 goals and 8 assists) in his last 16 games between Sioux City and the Tri-City Storm. Tufto should become a solid play-maker for Quinnipiac along with the ability to score goals. He had 25 goals in his only season with the Vernon Vipers (BCHL) in the 2015-2016 campaign. He is part of the 2017 recruiting class. 1998 forward Michael Lombardi of Kimball Union Academy was named to the New England Prep School Ice Hockey Association First Team All-East. In 36 games played he has 47 points (19 goals and 28 assists). He is averaging 1.31 points per game this season. Kimball Union opens the Stuart/Corkery Elite 8 Tournament Quarterfinals on March 1st at the number three seed where they will take on the sixth seed Thayer Academy. Two other prep players committed to Quinnipiac will play in the playoffs. 2000 defenseman Peter Diliberatore is playing for the seventh seeded Salisbury School in their match-up against second seed Dexter. Diliberatore finished his first season with Salisbury with 17 points (5 goals and 12 assists) in 29 games played. Its possible that Dilberatore and Lombardi could go head to head against each others team in the playoffs. 1999 forward Matthew Fawcett is playing for the number three seed Winchendon School in the Piatelli/Simmons Small School Tournament Quarterfinals against sixth seed Pomfret. Fawcett has had a big season for Winchendon scoring 51 points (23 goals and 28 assists) in 26 games played. He is on the affiliate list for the Sioux City Musketeers where he played two games for them this season. Both 1997 forward Matthew Creamer of the Nanaimo Clippers and 1998 defenseman Zach Metsa of the Merritt Centennials are both playing in the BCHL playoffs for their respective teams. Creamer, a native of Warwick, Rhode Island finished season as Nanaimo's second leading scorer with 36 points (19 goals and 17 assists) in 56 games played. Metsa in 57 games played has 27 points (3 goals 24 assists). He is tied for the team lead with 12 power play assists. 2001 forward Connor Tait helped lead the Gonzaga College High School to the MAPHL "AA" Division championship. Tait led the team in scoring in the playoffs with 8 points (5 goals and 3 assists). In 32 games played including playoffs for Gonzaga, Tait had 61 points (39 goals and 22 assists). He plays on a line with Providence College commit Cole Vallese. In January, Tait was a NCDC futures pick by the New Jersey Hitmen.